4 How loud is it? 5 Can I listen to music on it? 6 What kind of technology does the F85 have? 7 What kind of settings does it have? 8 Is it easy to fold up? 9 How Is The Sole F85 Treadmill delivered? 11 Who Is The Sole F85 For? 12 How Much Does The Sole F85 Cost And Where Can I Buy It? The Sole F85 treadmill review: My personal take on it and how I use it. Let’s face it, getting fit and then staying fit is hard work. You know what I mean. It’s not only hard because of all of the sweating and grunting. Even more difficult is the time commitment, finding the motivation, and the general inconvenience of dropping your everyday chores and carving out a portion of a busy day. If you have kids, a job, or school, this is even more difficult. Home exercise equipment has been a great alternative to the hassle of having to drive to the gym everyday. I definitely love the convenience of having my own equipment at my house. When I exercise at home I can keep an eye on my kids and not have to waste 30 minutes just driving to the gym and back every day. Not to mention how going to a crowded gym can be awkward and uncomfortable. Some people don’t want to own their own equipment because of the cost. Well going to the gym has costs too! Not only do you pay $50 a month for a membership but it’s $1 in gas every day you go and then there’s that $6 Starbucks iced coffee you always get to reward yourself after. Over the long haul, owning home equipment can make a lot of sense. The best and most useful piece of home gym equipment is the folding treadmill. If you get a high quality home treadmill you will never run out of exercise options. If you can adjust the speed and the incline, and if the treadmill has a few different exercise settings, you can get a full workout with just that one piece of equipment. Home treadmills are sold at almost any price range, but the absolute best folding home treadmill is the Sole F85. The Sole F85 has been rated as the best folding treadmill for at least the past several years. It’s not hard to see why. This treadmill has tons of features and is solidly built. It would be right at home on the floor at the YMCA or a Gold’s Gym. Sole hasn’t been making equipment for very long but they have quickly become a top brand in home exercise equipment. Sole easily competes with big names like Nautilus and Nordic Track. Firstly we should talk about how solid the Sole F85 is. Unlike cheaper home treadmills, the F85 isn’t made from those flimsy skinny tubes. The F85 has these really thick steel tubes that support the console and the the arms. The F85 is VERY heavy as well. This treadmill weighs almost 300 pounds! It is a serious machine that won’t rattle or shake as you run on it. I remember when I first got married, my husband and I went out and bought an exercise bike from Walmart for $60. We were determined not to let ourselves go just because we were off the market! Well, that $60 turned out to be a waste. That bike was so cheaply built that after 30 minutes of riding it all the screws and bolts would be loose. It would literally fall apart as you used it! The Sole F85 treadmill is nothing like that cheap bike. It is very solid and sturdy. There is no rattling of loose screws to speak of and it feels like you are running on $5000 treadmill at the gym. One of my favorite features on the F85 is just how quiet it is. The track actually has this cushion feature where the track has a little bit of give with each step. Not only does this make it very quiet but it reduces the impact on all of your joints. I actually have bad knees and I don’t like to run on concrete or asphalt. For a long time I only used the ellipticals because of their low impact. The F85 is great because I can use it without any pain. Also because it’s so quiet, I can watch tv, read a book, or study for my class while I’m working out. Can I listen to music on it? If you don’t want to watch tv or read a book you can actually listen to music on the Sole F85. The F85 has built in speakers on the console and you can hook up your phone or any mp3 player to listen. Sometimes I play music, but I really like to be productive so I will normally listen to an audiobook. What kind of technology does the F85 have? New for 2016, the Sole F85 is bluetooth compatible. This is a something that I can’t believe it is taking so long for companies to adopt. I recently bought a new car and there were cars on the lot that didn’t have bluetooth yet! It’s 2016, my kitchen sink should be able to hook up to my phone! The bluetooth is really neat on the F85, especially because of all of the fitness watches that are out now. Your Sole F85 will actually send fitness data to your Fitbit, Apple Health or Android Fit. This will definitely help me beat my friends in my Fitbit group. You can also use the bluetooth to view your fitness data on your smartphone. There is actually a Sole app that you can download and it will show you your live speed, calories, heart rate and other information. Also new on the 2016 Sole F85 is a 10.1 inch touchscreen. I think that all screens will be touch screens before too long so it’s no surprise that even our treadmills are going that way. It is nice but I don’t know if it is that much better than using the physical buttons. One thing that the F85 has had for years now is a wireless chest strap heart rate monitor. This is great because chest straps are way more accurate than pulse grips and Fitbits at monitoring your heart rate. You just need to strap the heart rate monitor right below your pectoral muscles and it will send accurate heart rate information to the treadmill and then to your phone if you want it to. You can adjust the speed of the F85 anywhere from .5 to 12 mph. I usually run at 6.5 mph but I use lower speeds to do lunges and side steps. The incline will go from flat to a 15% grade. You actually raise your heart rate more by increasing the incline than you do the speed. The F85 has speed and incline buttons on the arms of the treadmill. This is great for me because I usually run on the manual setting and just push the buttons on my own while I’m running. It must be the control freak in me. I rule the treadmill, the treadmill doesn’t rule me! If you aren’t using the manual setting than there are 10 other settings you can run to. There are 6 standard programs, 2 custom programs that you can build and save yourself, and 2 heart programs. The heart programs are kind of neat and they use the chest strap heart rate monitor. Those two settings are cardio and fat burn. With cardio, the F85 treadmill will adjust the speed and incline in order to keep your heart rate at 80% of your maximum based on your age and weight. With the fat burn program the treadmill adjusts to keep your heart rate at 60% of your maximum based on your age and weight. Is it easy to fold up? The Sole folding treadmills have to be the easiest treadmills to fold in the world. I’m serious! The F85 lifts easily because it has this hydraulic piston that helps, and then it latches in the upright position. When you want to let it down you just push against the track slightly and release the yellow lever. The track slowly lowers itself to the ground because of the hydraulic piston. When the F85 is folded up you can tilt it and wheel it out of the way because of the rollers that are on the base. This is awesome because treadmills take up a lot of space. The F85 folds up and moves out of the way easily. You may have trouble wheeling it through a doorway if you don’t have extra wide doors. The F85 is 37 inches wide which is wider than most doorways. If you just want to put it flat against the wall when it’s folded up it sticks out from the wall 34 inches at the base and 51 inches at the top. This is out of the way enough for me. How Is The Sole F85 Treadmill delivered? The Sole F85 is a monster of a delivery package. A special lift truck will deliver the package because it weighs 300 pounds. The box it comes in is 7 foot 2 inches long, 3 foot 2 inches wide, and 1 foot 5 inches thick. I have found that once the box is in its final location it is actually fairly simple to assemble. The package comes with all the tools you need and the instructions are very clear. It’s easier than assembling IKEA furniture. You should be able to set it up in under an hour. 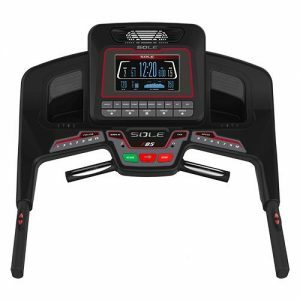 Sole has several models of treadmills at different price points. Just below the F85 is the Sole F80 treadmill. Both are excellent treadmills and while the F85 was rated “best folding treadmill” the F80 was rated as “best treadmill in its price range”. You aren’t going to get a bad treadmill if you choose the F80 over the F85, but you do get a few less features. The Sole F80 has a lower carrying capacity than the F85. The F80 has a weight limit of 375 pounds while the F85 has a weight limit of 400 pounds. This difference is obviously only important to a very small handful of people, but there are other more important differences. The Sole F80 has a less powerful motor than the F85. The F80 has a 3.5 CHP motor while the F85 has a more powerful 4 CHP motor. Having a more powerful motor means that it can change speeds faster and is less affected by you, the runner. The last difference is that the F80 does not have a touch screen display. The Sole F80 has a 9 inch blue and white lcd display where the F85 has a 10.1 inch touch screen. Less features means that you can get the F80 at a lower price than the F85. $500 lower, in fact. Of course only you can decide if saving $500 is worth losing some of the features on the F85. Who Is The Sole F85 For? The Sole F85 treadmill is the best folding treadmill on the market. Really it’s for anyone who wants to make a long term investment in their personal and family health. The Sole F85 will definitely last a long time and even has a lifetime warranty on the motor, deck, and frame, and 5 year warranty on electronics and parts. The F85 will pay for itself over its lifetime and is worth every penny in my opinion. How Much Does The Sole F85 Cost And Where Can I Buy It? You can buy the F85 at a few different places, including Amazon. We recommend Amazon due to the easy returns policy should any issues arise and the speedy customer service. Right now there seem to be some good deals due to competing sellers. Hey thanks so much for all the great information on treadmills here. I didn’t know there was so much going on with them today. I found this post very informative and I’ll be using everything I learned here to make a knowledgeable purchasing decision. Thanks for the great post! Hi! I’m with you – I love having a treadmill at home. This looks like a really good one. I like the idea of a touchscreen for the controls – a lot easier to use than pushing buttons. I’m wondering – since it’s so big and heavy, does Amazon have an extra delivery fee? Great review, by the way. I appreciate hearing about your own personal experience with the treadmill. Great info about this treadmill! I love the cool feature where you can send data right to your devices. Also love the sturdiness of the machine. I was looking for a treadmill that played music. I don’t like running with headphones in at home so this is perfect! Thanks for the information about it being a quiet treadmill too. Great information on this treadmill! It’s one of the next pieces of equipment on my list to add to my own home gym and this looks like a great buy!